It’s like the cards were mocking me, I pulled the 6 of Wands, key word – Victory. An important trait to look for in someone running for President is that they are victorious. Ha – well, of course! But all joking aside, the card has a little more to say than that. 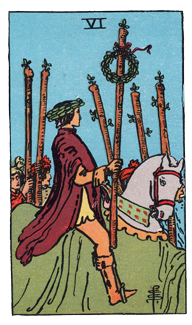 It shows not only the victor carrying his wreath of glory, but other people also walking alongside him, wands raised in support. All the sixes are connected with the grand six in the deck, the Lovers, which speaks of relationships, commitments, and the connections between disparate elements. This 6 of Wands identifies that energy played out on a spirit level. This card suggests that a positive Presidential trait is an ability to raise the passion of the people in unity and connectedness. As well, it points to the importance of those very people as they walk beside their champion. He got to his place on the horse with the help of them all. In fact, no one get to this 6 of Wands position alone and a good leader knows that. You are currently reading Positive Traits for a President … at The Tarot Room.